Will this program be Windows only? I sounds similar to JMRI, but perhaps simpler. I like that it leaves the crews to decide how to make up a train. Does it look ahead, for instance I would switch an arriving train and would like to pull cars departing from industries at the same time, something other programs don't seem to do well. I do have a load driven card system on my home layout, but it still uses car cards and waybills. Our group's modular layout uses JMRI or another card based system, but this time the cards are the loads and we write the car number to be used on them. For a modular layout this is far easier as the cars change, but the modules industry spots stay the same (if a module doesn't come we remove the cards). It also involves less cards, there are more cars than spots. As there is one card per spot an industry can't be overloaded. We would need a program that can handle several trains on the road at the same time, with the ability to easily change routes and modules used. G'day barganax. First of all, sorry about taking so long to reply. I've been neglecting the forums lately and just now decided to catch up. It sounds fascinating. I have my own manual system where the waybills drive the action rather than the car cards. The only reason I use the car cards and waybills with the trains is that it means I don't have to write out a switchlist every time. I'm by nature lazy and having drafted out a set of waybills balanced to my layout and created the car cards, no more writing is necessary. So the "program" is a process in my head. It seems like we both have all the basic elements in place and working in much the same way. I find it interesting that you say you have the index to the waybill in the car record rather than the other way around, which is what I might have expected where the waybills drive the system. I'm a computer system developer by profession so I understand these things. But it's what works that matters. My "random" element is that I have a pool of waybills representing, say, a week's work at my industries, on stage and off, that I shuffle and then deal out a number to represent that day's new orders. These then get assigned to cars and the cars move accordingly. In my system the waybill has four parts and I include the car movements empty from storage, loaded to customer, then empty back to storage as three parts on the waybill. The waybill then goes onto a discard pile and when the pickup pile is empty the discards are shuffled and put back into the main pack again. That supplies infinite variations in the trains. I'm happy to discuss this further with you if you wish. If the Moderator doesn't think it should be on the forum we can discuss it outside. If you wish. My home layout has a sheet that I roll dice against, the dice result referenced to the sheet determines the car types and numbers. The sheet gives upper and lower limits to numbers selected, in some cases even or odd gives a choice of two. This means the industries drive the car requirements. Mike, is that a sheet per industry or a dice roll per industry? I'd be interested in an example in more detail. 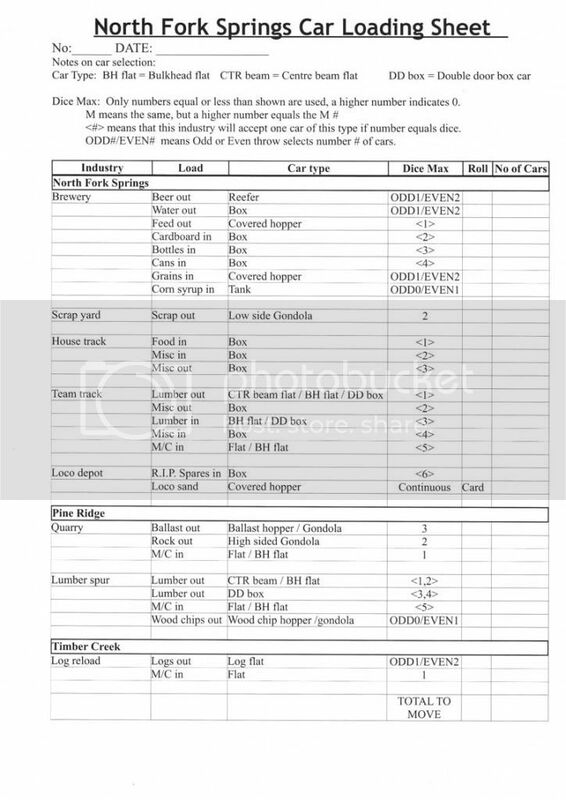 It is one sheet for the whole layout, but one roll per product per industry. Here is an old copy, I've since changed some industries and added a branch, virtual at the moment! That looks pretty good to me. It has a wonderful random element in it which is what makes the work more interesting. I guess your ODD#/EVEN# works well for those industries where the arrival of cars is more regular. Where do the cars come from or go to? Do you always assume staging? Is there only one staging area? If a car is available locally, e.g. sitting in North Forks yard and not assigned it gets used, otherwise they are picked from trains sitting in the staging yard or taken from off the layout and placed on one of the locals. I have waybills that go with the product and they determine what happens to the car once it is loaded / unloaded, usually just says go east or west. The proceedure for setting up is, roll the dice and fill out the sheet. Then select the waybills for all the products, assign them to a car. Put the cars into local trains and then start running. Once all the locals have made it back to staging I select the next set of cars. In between locals the turns deliver and retrieve cars from the branch and local industries to send back out on the locals. Looks like a very effective system to me Mike. It's interesting the variety of solutions that people come up with to run their operations. From simple ones like swap like for like cars when you get to a switching point to sophisticated use of car cards and waybills and switch lists and however they're assigned. The prototypes give us means of controlling the movement of trains, but I think we're a bit less organised as a group as to how we manage what cars are to be moved. That seems to be an area where everyone does their own thing with little relationship with what everyone else is doing. You see the odd article about how an individual does it, but there seems to me to have been no attempt to document or discuss the different techniques involved or their effectiveness. I think this might be a very useful subthread of the OPSIG forums. It's a feature of running model railroads that fascinates me above all others and seems to be neglected above all others. I presume that whether you pick the car from the yard or staging depends on whether the car required is empty or loaded. An empty car could come from the yard, but a loaded one would have to come from staging, or have been loaded from an on-layout industry. Mike_R wrote: If a car is available locally, e.g. sitting in North Forks yard and not assigned it gets used, otherwise they are picked from trains sitting in the staging yard or taken from off the layout and placed on one of the locals. calaf01 wrote: I presume that whether you pick the car from the yard or staging depends on whether the car required is empty or loaded. An empty car could come from the yard, but a loaded one would have to come from staging, or have been loaded from an on-layout industry. Yes only empty cars would come from the yard, I don't have any online to online moves, the layout only covers a 13 mile section. Although empty cars are normally sent away when there is space on a train or they clog up the yard. The vast majority of cars come from staging, the rest of the west coast!